Pound for pound, my favorite Christmas gift this year was my Baking Steel. That pound for pound comment was a joke. It is heavy. Most people have heard of a pizza stone. The Baking Steel serves the same purpose, only much better. Think of it as a pizza stone on steroids. I’ll tell you this: even my most mediocre attempts with it have been better than any pizza I’ve ever made at home. The crust is phenomenal. It is basically a slab of steel, just like the name implies. You preheat it for about an hour. 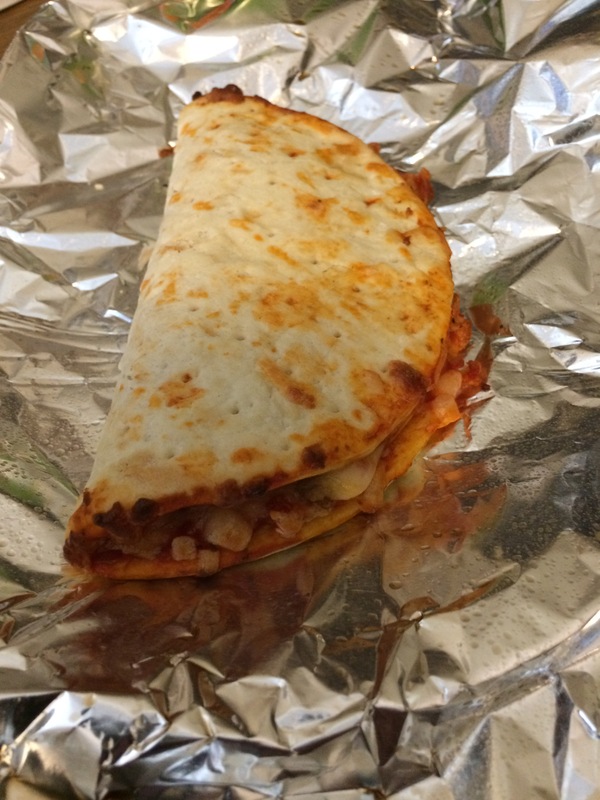 You assemble your pie, and using your pizza peel you launch it onto the hot steel. About 5-6 minutes later you retrieve it and … mama mia! I’ve watched this company grow from their facebook postings over the last several years. I couldn’t take it anymore. “This is what I want.” The flat HEAVY present under the tree was no secret. They make griddles too, although you could use the basic product as a griddle for something like pancakes. Just nothing with too much grease. I know it is expensive but your grandchildren will thank you for leaving them this awesome heirloom. It will last that long. Thomas Fenske is a writer living in North Carolina. Hmmm, how about pizza tonight? This is just another fine-tuning of my Amazon blurb … I think it’s getting there. The description of gooey, spicy, goodness that followed spurred several readers to ask the author, “Is that a real dish?” Now you can see for yourself! Smidgeon will entertain you with her quirky, homespun wisdom as she shares a mini-history of the cafe along with some insight into what helps to make The Mossback a unique and delightful locale in the world of fictional eateries. Along the way you’ll learn how to make her awesome square biscuits. She also reveals details about the full-sized heap of bacon they serve on “THAT BLT, ” and introduces readers to other local favorites like the “Double Trouble Dog” and what has to be the “Best-Danged Buttermilk Pie” you’ve ever tasted. As an added bonus, she has agreed to share her famous Potato Salad Secret, something surprising and simple that will take even the best potato salad recipe and crank it up a notch, maybe two! Simply put, these are all part of what would have made The Mossback Cafe famous, well, if it actually existed. So hop out of your pickup truck and mosey on in … there just might be some breakfast tacos or enchiladas lurking in your future. The Mossback Cafe Cookbook is still mostly FREE … check out my website for the free venues as well as the link to Amazon where it is 99 cents. Feel free to share one of the other sites to them using the report a lower price option. Or if you insist, buy it but be aware that there is a kindle version available at the Smashwords link. While you’re there, feel free to browse my other books … summer is a great time to Catch THE FEVER! 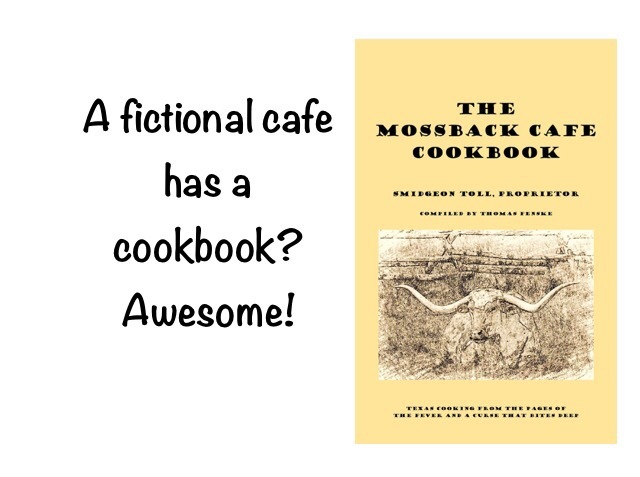 Just to be clear … The Mossback Cafe Cookbook is more than a cookbook. It is a true companion book to my novels. They introduce the backdrop of the place and they intoduce owner Smidgeon Toll. The books are basically stories set in Texas and so, the cookbook has a strong Southwestern influence. The cookbook takes that base and gives Smidgeon a chance to tell us all a little more about her background and the cafe. The recipes are real and the information she shares is a valuable resource that will enhance your enjoyment of the existing novels and subsequent stories in the series. So, when you see the word “cookbook” — look beyond it, and consider this to be a stepping off point. But don’t get me wrong, the recipes are easy and accessible to even fledgling cooks. And delicious. Check it out … it is only in ebook form and it is only 99 cents. I was pleased to get the first review of The Mossback Cafe Cookbook today. I’m still waiting to clear up some technical issues before uploading the book to Amazon, so this review is on Smashwords. It is also my first review on Smashwords! The review is by Laura Rittenhouse, a fellow writer. I’m honored. Be sure to look her up on Smashwords and Amazon! If we were having coffee today I’d have to break the news. The first thing I’d say is that I’m embarrassed. Ever since I got this idea, I’ve been hammering away at it. I recruited family members, friends, and acquaintances to give me feedback. Most have read my novels. I wrote my novels. Finally this week, I was ready to take a big leap and upload this thing to Amazon. I had second thoughts about the title. I loaded up my first book and did a quick search. Ack!! Okay, I admit it. In the novels, I never called the restaurant The Mossback Inn. Never. Not once. Always Cafe. Nobody noticed. Especially me. As big a problem as it now seems to me, it probably doesn’t matter. Still, I could have sworn I did that search earlier, but obviously, I didn’t. So I considered my options. Although I’ve marketed it informally for a couple of weeks, I still considered it in beta mode, that is, in computer terms, a high-level test. If I still need to make changes, now would be the time. Thank heavens I hadn’t uploaded it. One option was just to ignore it, or add a paragraph in the forward about how it was originally called The Mossback Inn. That was a viable possibility. The other option was to just bite the bullet, make the changes to Cafe, and continue on as before. There really weren’t that many changes needed in the cookbook. There were quite a few on the website. I needed to change the cover, but once again, that is not a major change. I decided to check out one thing before I made the decision. I Googled it. So, today, I’m launching an extended beta test with the rebranded title. The Mossback Cafe Cookbook. I think “Cafe” will likely play better in social media. What do you think? The rest of the cookbook is exactly the same. Feel free to download a copy. There are files for epub (good for Nook, iBooks, Kobo), mobi (kindle), or pdf (just about everything will open pdf … hey, you could read it at work! ).